Has BURGER KING Made ‘the WORST’ Campaign Ever? #GRILLTHEWORST - Etcetera Amsterdam helps BURGER KING® launch new product for 2018: Grilled Dogs. Cannes Lions’ Marketer of the Year 2017, BURGER KING®, has worked with Amsterdam creative agency Etcetera to launch a new campaign for their latest product release in the Netherlands in 2018: Grilled Dogs. Those unacquainted with the Dutch language might miss the twist: the Dutch word for hot-dogs is ‘worst’. 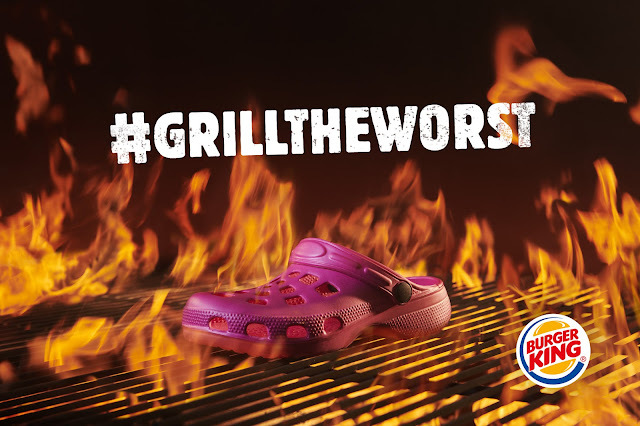 And as BURGER KING® is known for flame-grilling since 1954, the campaign idea is #GRILLTHEWORST. The #GRILLTHEWORST campaign asks everyone who has something they want to let go of - big or small - to join an activation event in Amsterdam on Monday 15 January, where a team of BURGER KING grill masters will fire up the grill and ceremonially set light to the ‘WORST’ of 2017. The campaign is launched by an online video featuring a series of ‘WORST’ things hitting the grill and getting flamed. Pink plastic clogs, tax bills and other ‘worst’ items from the year take a hit on the grill. AdStasher: Has BURGER KING Made ‘the WORST’ Campaign Ever?